HARLINGEN — Valley church leaders yesterday called on U.S. Rep. Henry Cuellar to join the push for a Congressional showdown to decide the fate of the so-called Dreamers. Valley Interfaith wants Cuellar to follow the example of U.S. Reps. Filemon Vela, D-Brownsville, and Vicente Gonzalez, D-McAllen. They announced Tuesday they would sign a petition by backers of the Deferred Action for Childhood Arrivals program, or DACA, which President Donald Trump canceled last year. The group’s leaders met with Gonzalez’s staff on Friday and with Vela on Monday, urging the congressmen to sign the petition. The announcement brings Congressional supporters of the petition within three signatures of the 218 needed to trigger a House vote on the fate of about 800,000 Dreamers. “We’re glad they made the decision and we have to continue. We have a long way to go,” the Rev. Daniel Flores, Bishop of the Catholic Diocese of Brownsville, told reporters at a press conference at Queen of Peace Catholic Church here. Rev. Bill Duke, pastor of First United Methodist Church in Mission, called on Cuellar to sign the petition. 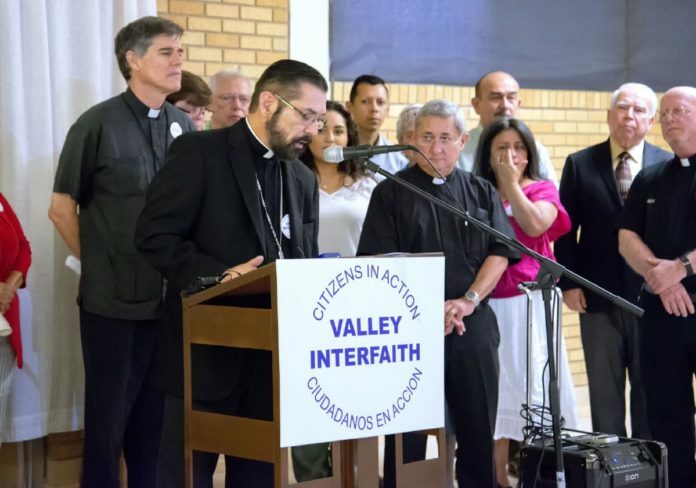 Valley Interfaith, which represents churches in the Valley, wants to meet with Cuellar, said Eddie Anaya, a Las Milpas attorney on Valley Interfaith’s executive committee. Cuellar’s office did not respond to messages requesting comment. On Tuesday, Vela stated he would not vote in support of a DACA bill tied to funding of a border wall. Yesterday’s press conference followed a February event in which Valley Interfaith sent out 10,000 postcard-styled petitions urging lawmakers to support the so-called Dream Act. Yesterday, Valley Interfaith leaders also spoke out against a new federal order calling for the prosecution of all persons illegally crossing the U.S.-Mexico border. Since Attorney General Jeff Sessions announced the order May 7, hundreds of children have been separated from their parents. Now, a law authorizes the Department of Homeland Security to reject immigrants if they are or are likely to become a “public charge” — dependent on government assistance. Currently, the law exempts many programs, particularly those supporting immigrant children who are U.S. citizens and eligible. Under the new proposal, programs such as Medicaid, the Children’s Health Insurance Program, food stamps, subsidized health care under Obamacare and Head Start education programs would serve as demerits against immigrants’ applications for legal residency. “It will make parents decide between putting food on the table and applying for citizenship,” Anaya said.